Rapid soothing, regeneration and protection for sensitive, irritated skin and couperose. 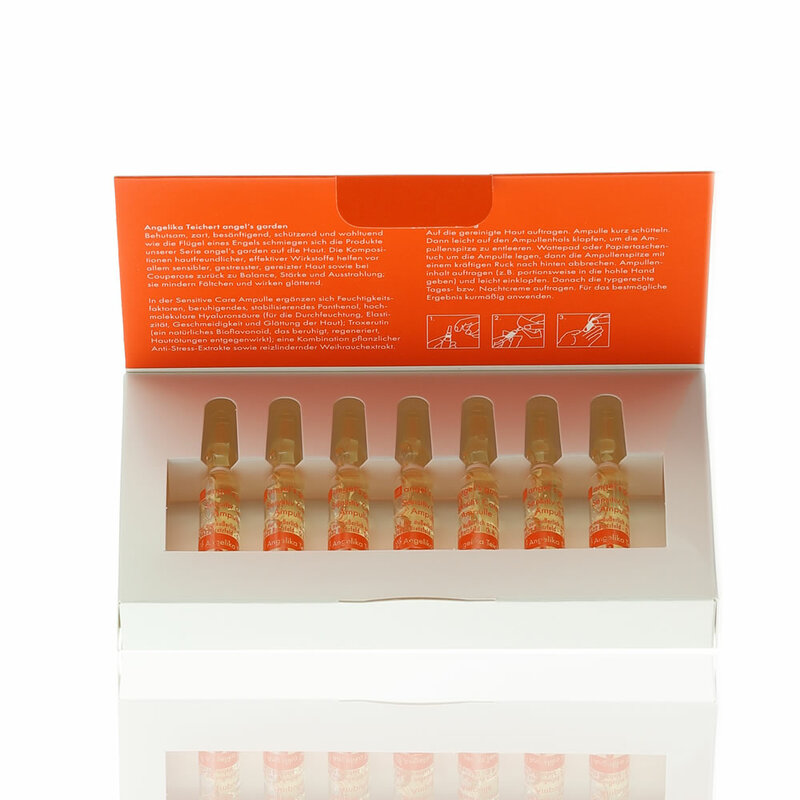 This gentle, highly effective ampoule combines an intensive hydration with soothing, regulating, strengthening and building active ingredients. Helps to alleviate skin irritations, prevent redness or allow it to subside more quickly and strengthen the skin's barrier function. Regular use strengthens the skin's resistance to stress. The appearance of the skin is refined and smoothed. Apply morning and evening to cleansed skin. Then apply type-appropriate care cream. For the best possible result, use as a spa treatment. AQUA (WATER), METHYLPROPANEDIOL, PANTHENOL, PENTYLENE GLYCOL, CAPRYLYL/CAPRYL GLUCOSIDE, PROPANEDIOL, DIPROPYLENE GLYCOL, GLYCERYL GLUCOSIDE, GLYCERIN, SODIUM HYALURONATE, TROXERUTIN, ALBATRELLUS OVINUS EXTRACT, TEPHROSIA PURPUREA SEED EXTRACT, ARGININE, PANTOLACTONE, SODIUM COCOYL GLUTAMATE, BOSWELLIA SERRATA GUM, POLYGLYCERYL-5 OLEATE, GLYCERYL CAPRYLATE, TETRASODIUM GLUTAMATE DIACETATE, LACTIC ACID, CITRIC ACID, SODIUM HYDROXIDE, PHENOXYETHANOL. Zugunsten einer bestmöglichen Verträglichkeit wurde auf künstliche Farbstoffe, PEG-Verbindungen; Erdölprodukte; Silikonöle sowie Parfüm verzichtet.